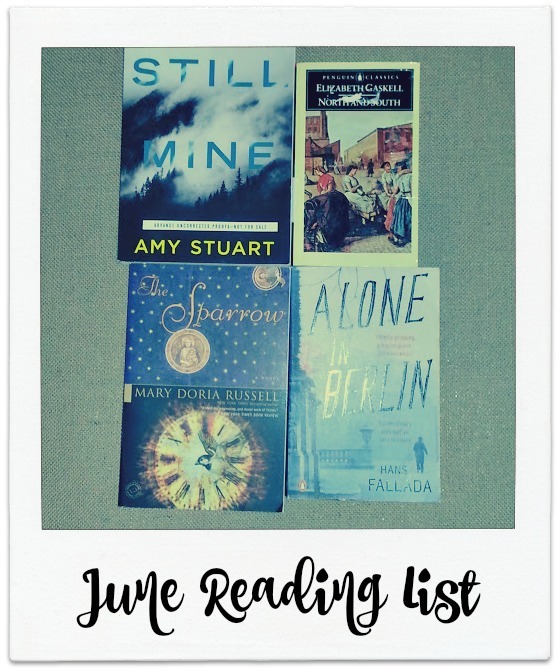 I can't believe we're already a week into June and I haven't put up my June reading list yet. These books have been sitting on my breakfast island waiting for their write up, so I figured it's best just to do it. I'm still trudging through We Wish to Inform You That Tomorrow We Will Be Killed With Our Families, and while I'm making daily progress on it, it's not the kind of book you want to sit down and plow through on a Saturday afternoon. Trying to absorb all the history and horror is hard and exhausting. So, I read a chapter here and there and then set it down and come back to it. So, I was looking for some lighter June reading. Here's what I've chosen. North and South by Elizabeth Gaskell is my classic pick for the month. Someone on Goodreads summed it up as Pride and Prejudice for Socialists. I'm not sure if that makes it more or less exciting for me to read it, but it does pique my curiosity. The Sparrow by Mary Doria Russell is a novel of epic proportions. It involves Jesuit priests in space travel to visit alien life with horrific results. Only one member of the mission makes it back and he refuses to talk about what happened. Which really just makes me want to know what happens. :) I received it from A Book Olive in a past swap and while I have some pretty ambitious goals for June, and am not sure I'll get it read, I really hope I do. Alone in Berlin by Hans Fallada is a book I selected without really knowing what all it was about. I thought it was a fictional story of a father who lost his son, who was a Nazi soldier, in World War II, and decides to protest the Nazi regime by posting anti-Nazi postcards around Berlin. But, it's really based on the true story of Otto and Elsie Hampel, and their grief after their soldier son is killed, and their attempt to stand against Nazi control. Hans Fallada's story sounds almost as interesting as the Hampels. He was a writer prior to the start of the Third Reich, and was born Rudolph Ditzen. (There's even a few mentions of him in Erik Larson's In the Garden of Beasts.) He refused to pump out propaganda for the Nazi's and was pretty much blacklisted. He suffered morphine addiction, was jailed and had kind of a chaotic life, but shortly after the war, he wrote this book. I'm not sure how light of reading it's going to be and I have even more book goals that I'll tell you about later, but let me know what you're planning on reading this month. I'm always looking for new titles to check out.